There are quite a few homeowners who dream of creating an outside space that is comfortable enough to entertain guests and spend time on regularly. If you take the time to setup the space and use high quality items, such as Royal Covers, you will find that creating this tranquil, inviting space is not only possible, it is actually much easier than you imagined. If you are ready to transform your outdoor area into an inviting paradise, use the tips and information here. Even though there are some homeowners who have a skylight in their living room, there is nothing that can beat the comfort of natural, warm sunlight. Creating a pergola is a quick redecorating idea to enjoy your patio throughout the summer as fall months. You can place your well-cushioned furniture under a pergola and have an instant space that brings the comfort of your living room right into your outside area. When you first think about it, there is no way that a stone wall is going to be even close to as comfortable as a couch. However, if you add a few oversized, fluffy pillows, you may be surprised about what you can create. This type of feature provides plenty of seating for guests and allows everyone to enjoy the fresh air outside. An exterior bar is a patio must-have for summer entertaining! It offers the perfect spot to relax, eat or settle down to have a drink with family or friends. The best part is, you don’t have to worry about anyone walking all over your clean floors inside with their dirty shoes. Everything you need or that your kitchen has, you can stock outside in your new bar. This will help you keep everyone refreshed and minimize damage to your carpet. Every backyard space needs a location where you can take a nap and there are so many easy decorating ideas to create the perfect sleeping nook. One of the best ways to implement this into your space is by putting up a hammock. These are always handy and something everyone in your family can use and enjoy. Consider hanging one (or several) in a pergola. This gives you some shade and helps add a bit of class to your outside area. If you want to create a cozy space to spend time even when it is cold outside, then all you need to do is install an outdoor fireplace. This is a great decorating feature, surrounded by all types of fall foliage will not only be functional, but also extremely beautiful. This is something that is probably going to become your new favorite spot. If you want a way to really set the mood, then lighting is a must. This is one of the easiest ways for you to bring the inside- outside. You can hang up just a few light fixtures from your patio or pergola and maximize the function and look of your outdoor space. Keep in mind, there are a large array of lighting options to choose from, so be creative. A word of caution, however, is to make sure you purchase exterior grade lighting so that your fixtures are not damaged by rain, snow and other natural elements. Today, furniture manufacturers have gone a long way to create exterior quality furniture that looks good enough to go inside and that is ultra-plush. Now you can enjoy all the comforts of your living room thanks to this amazing furniture that is available. Chances are, once you get comfortable you’ll have no reason to go back inside. If you are trying to create an amazing, inviting outdoor area, then make sure to keep the tips here in mind. These tips will help you create a space you never want to leave. You don’t have to spend a fortune to get an inviting space, just make sure to implement these tips and enjoy the many rewards that are seen. 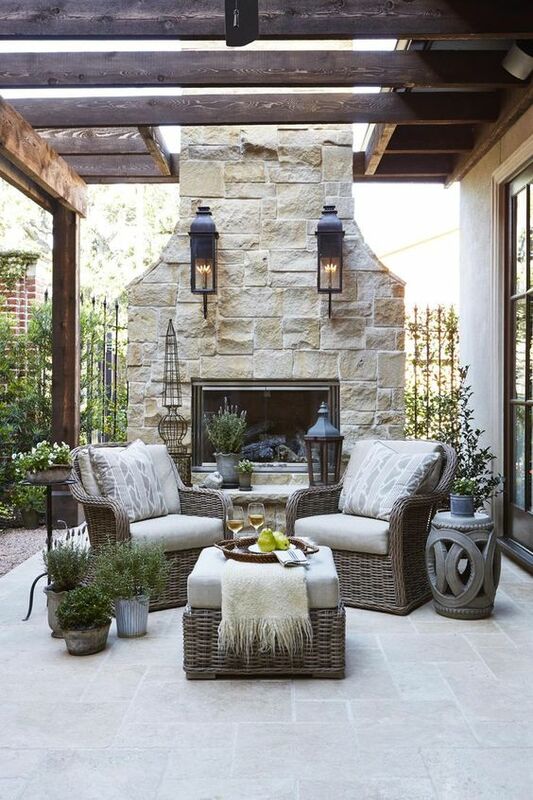 This entry was posted in Gardens and tagged backyard decorating, outdoor decorating, patio, patio decor ideas. Bookmark the permalink.